Maria Emily (Strickle) Bickham was the wife of Dayton Journal editor William D. Bickham (see bio sketch) and mother of Congressional Medal of Honor recipient Charles G. Bickham (see bio sketch). Maria’s parents were Abraham Ellis Strickle (1807-1863) and Caroline Goodwin (d. 1867), of Wilmington, Ohio. Maria’s father Abraham was the director of the Clinton County Fair. Elizabeth Ann Strickle (1831-[after 1900]), who married John W. Dunham in 1859, then John C. Deuell in 1869. Maria Emily Strickle (1833-1924), who married William Denison Bickham in 1855. Mary Gano Strickle (1836-1897), who married George K. Farquhar in 1858. Katharine Jane Strickle (1838-1919), who married Rodney Foos in 1856. Caroline Margaret “Carrie” Strickle (1840-1923), who married Captain John W. Clous in 1874. Rebecca Harriet Strickle (1843-1933), who never married. Frances Williamson Strickle (1845-1894), who married Col. Henry C. Corbin in 1865. Abraham Strickle died in July 1863 as a result of a fever contracted near Vicksburg during the Civil War. His wife Caroline died in 1867. 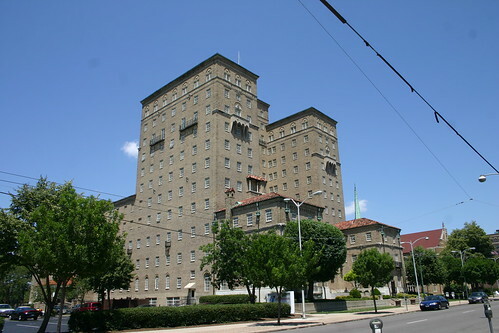 Afterwards, their unmarried daughters Carrie and Rebecca lived with their sister Maria Strickle Bickham and her family. Carrie Strickle Clous and Katherine Strickle Foos later lived with Maria again after their husbands had passed away. Rebecca, who never married, lived with her sister Maria Strickle Bickham, and later with her nephew Charles G. Bickham, for the majority of her life. This biographical sketch was originally written by Lisa P. Rickey in April 2011 for the Bickham Collection (MS-017) finding aid at the Dayton Metro Library, 215 E. Third St., Dayton, Ohio, 45402; phone (937) 496-8654. Additional information about the sketch’s subject can be found in that collection and in the citations below. Please contact the library or this blog’s author for more information about how to access the original finding aid or the manuscript collection. Foos, Katharine S. The Ellis Family. Dayton: United Brethren Publishing House, 1900. Dayton Local History B92 E47F. Santmyer, Helen Hooven. A Calendar of the Bickham Collection: Letters, Documents, and Mementoes of Possible Historical Interest. Dayton:Dayton Public Library, 1956. Dayton Local History 016.091 D276C. Box 2, Folder 15: Genealogical Notes on Bickham and Strickle Families. Box 2, Folder 16: Abraham E. Strickle Memorial Album & Civil War Documents. Charles Goodwin Bickham was born August 12, 1867, in Dayton, Ohio, the youngest son of William D. Bickham and Maria (Strickle) Bickham (see also: W. D. Bickham sketch). Charles G. Bickham was a career soldier. He served as a Colonel on the staff of Ohio Governor [and later president] William McKinley. During the Spanish-American War, he served as a Private in Company G, Third Regiment, Ohio National Guard, and later a Captain in the Ninth Regiment (Immunes), U.S. Volunteer Infantry. He served as a Captain during the Philippine Insurrection in the Twenty-eighth Regiment, U.S. Volunteer Infantry, under Col. William Birkhimer. After receiving his commission in the regular army as a Lieutenant, he served again in the Philippines with the Twenty-seventh U.S. Infantry under then-Captain John J. Pershing. 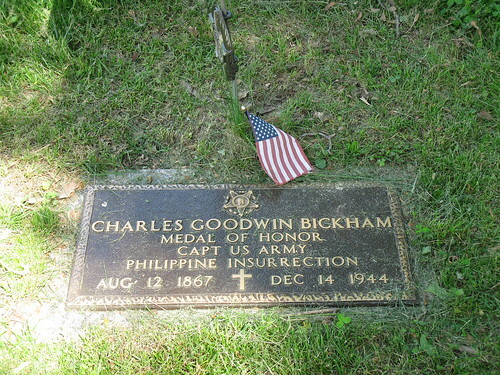 C. G. Bickham was awarded a Congressional Medal of Honor in 1904 for “distinguished gallantry” at the 1902 Battle of Bayang, Mindanao, Philippines. 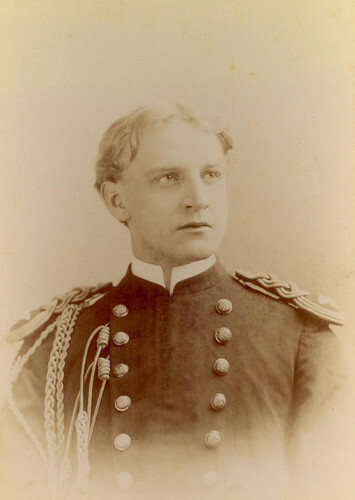 However, after twice failing the professional examination required for promotion to captain in 1909 and 1910, he was honorably discharged from the army in June 1910. During his time in Cuba and the Philippines, Charles wrote several letters to family and friends, many of which his brother Daniel published in the Journal. Brother Abraham also served during the Spanish-American War. It is also worth mentioning that both Charles and Daniel Bickham were members of the Buzfuz Club. Charles G. Bickham died December 14, 1944, in Dayton, Ohio, and was buried in Woodland Cemetery. He never married. The 9thRegiment,U.S. Volunteer Infantry was an African American regiment as well as an “Immunes” regiment. The Immunes regiments were made up of men from southern states, who were inaccurately believed to be immune to tropical diseases. [LPR] See: Brad K. Berner, The Spanish-American War: A Historical Dictionary (London: Scarecrow Press, Inc., 1998), pp. 185-86; also, “9th U.S. Volunteer Infantry,” Spanish American War web site, http://www.spanamwar.com/9thUSvolinf.htm. Important Note: I personally re-posted a large portion of this biographical sketch (including the photograph) on Charles G. Bickham’s Wikipedia page. Therefore, any similarity between this blog post, the original finding aid bio sketch, and the Wikipedia page, is due to the efforts of the original author (me), rather than an act of plagiarism. Bickham, William D. A Buckeye in the Land of Gold: The Letters and Journal of William Dennison Bickham. Edited by Randall E. Ham. Spokane: Arthur H. Clark Co., 1996. Dayton Local History 979.404 B583B 1996. 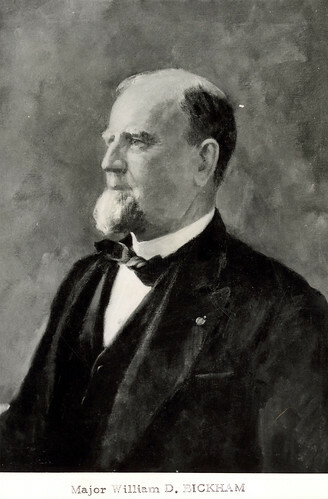 “Charles G. Bickham,” Wikipedia, http://en.wikipedia.org/wiki/Charles_G._Bickham. Conover, Charlotte Reeve. Dayton, Ohio: An Intimate History. New York: Lewis Historical Publishing Co., 1932. Page 245. Dayton Local History 977.173 C753DAY 1932. Conover, Frank. Centennial Portrait and Biographical Record of the City of Dayton and of Montgomery County, Ohio. Chicago: A. W. Bowen & Co., 1897. “William Denison Bickham,” pages 403-404. Dayton Local History 977.172 C753C 1897. Drury, Augustus Waldo. History of the City of Dayton and Montgomery County, Ohio. Chicago; Dayton: S. J. Clarke Publishing Company, 1909. Volume 1, pages 400-401. Dayton Local History 977.173 D796. Box2, Folder 15: Genealogical Notes on Bickham and Strickle Families. Box2, Folder 14: C. G. Bickham: Letters concerning Military Career. William Denison Bickham was born March 30, 1827, in Riverside (near Cincinnati), Ohio, the eldest of seven [surviving] children born to William Ard Bickham (ca. 1798-1845) and Eliza Dennison (1802-1893). William D. Bickham attended both public and private schools in Cincinnati, as well as Cincinnati College and Bethany College (in present-day Bethany, West Virginia). However, William’s formal education ended abruptly in 1845 when his father died and he had to return home as head and financial supporter of the family. At that time, William started a two-year apprenticeship with the Cincinnati Gazette, where he learned typesetting, and thus began his career in journalism. Afterwards, he worked as an editor at the Louisville Courier, but his family’s finances forced him to return to Cincinnati in 1848. In the fall of 1848, William took a flatboat journey from Cincinnati to New Orleans and back with his brother John. In 1849, William worked as a clerk at a mercantile business. Then, in March 1850, William set out for the California gold rush. He spent more than a year in the mines near Grass Valley in Nevada County, California; then, in 1852, he represented El Dorado County, California, at the state’s first Whig convention. Eventually, he settled in San Francisco, where he was a customs officer; one of the founders of San Francisco’s first public library and its first librarian; and was, at different times, an editor of several San Francisco newspapers: Picayune, Evening Journal, Evening Times, and Morning Ledger. Meanwhile, he also still wrote home to the Cincinnati Gazette, describing life in California. William did not strike it rich in the gold rush, and he returned home to Cincinnati in April 1854. For a time, he worked on the Cincinnati, Hamilton, & Dayton Railroad as a brakeman and later a baggage master. Before long, he was involved in journalism again. He was a correspondent for the Cincinnati Daily Columbian and later the Cincinnati Evening Times. On December 27, 1855, William D. Bickham married Maria Emily Strickle (b. Dec. 1833) at the home of her parents, Abraham Ellis Strickle (1807-1863) and Caroline Goodwin (d. 1867), of Wilmington, Ohio (more on Strickle family). Maria’s father Abraham was the director of the Clinton County Fair, and William had most likely met the family while covering county fairs for theCincinnatinewspapers, which was one of his usual assignments. By 1856, William had become city editor of the Cincinnati Commercial, under editor Murat Halstead. In this capacity, William was a correspondent of political news in Columbus and Washington, DC. This afforded him opportunities to meet many public figures who would later rise to even greater prominence as governors, congressmen, senators, cabinet members, and even presidents, several of whom remained in correspondence with him for years. When the Civil War broke out, William spent two years as a war correspondent on the front, sending his dispatches back to the Commercial. He was first assigned to General William Rosecrans’ army, where he was a volunteer aide-de-camp with the rank of captain. He also spent several months with General George McClellan’s army, before being transferred back to Rosecrans. He was present at the Battle of Stones River, and Rosecrans’ praise for his actions there earned him the rank of major. While William was reporting from the field, matters on the home front in southwest Ohio were heating up. 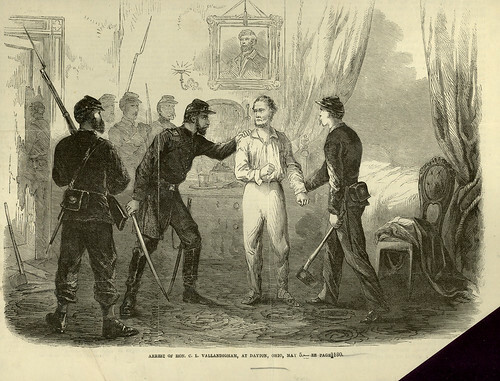 On May 5, 1863, General Ambrose Burnside arrested congressman and Dayton resident Clement Vallandingham on charges of sedition. Vallandingham was one of the most vocal leaders of the Copperheads, a group of Democrats who opposed the war. In response to his arrest, a Copperhead mob burned down the Republican, pro-Union Dayton Journal newspaper office. A group of pro-Union Daytonians formed a committee to restore the Journal and sought help from Cincinnati Commercial editor Halstead in finding a new editor for the Journal. Halstead recommended William D. Bickham. The committee offered Bickham the job, and he accepted, moving his family to Dayton. Bickham took over the Journal on May 11, 1863, printing a small issue for the next several weeks until the main press was repaired. A sum of $6,000 was offered to Bickham as a gift to get the newspaper up and running again; he refused the gift but accepted it as a loan, which he paid off in less than 3 years. The first regular issue of the Dayton Daily and Weekly Journal reappeared on July 28, 1863. 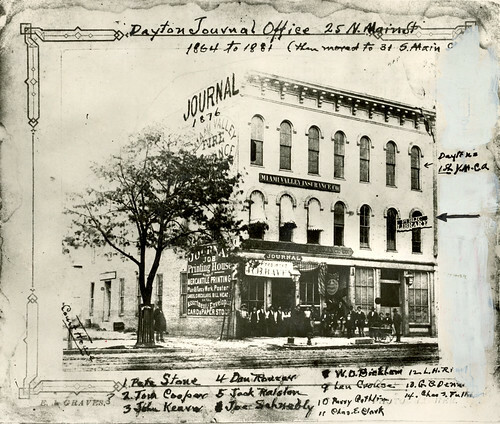 When the Journal reopened in July 1863, its offices were protected by two loaded cannons. Bickham himself was reportedly threatened with bodily harm on numerous occasions through the end of the war. Nevertheless, he stood firmly behind his Republican opinions and his newspaper, throughout the Civil War and through the end of his life. 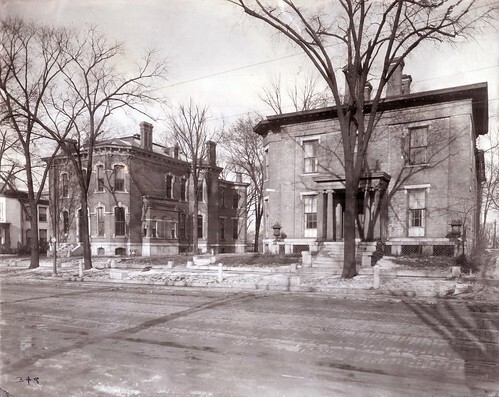 William Denison Bickham died on March 27, 1894, at his home on Monument Avenue in Dayton. On March 30, he was buried in Woodland Cemetery in Dayton. His wife Maria Strickle Bickham lived 30 more years, dying on October 17, 1924, in Dayton; she was also buried in Woodland Cemetery. William Strickle Bickham (born Nov. 22, 1856; died June 16, 1912), who moved toSpokane,Washington. Victor Hardy Bickham (born July 4, 1858; died June 22, 1865), who drowned. 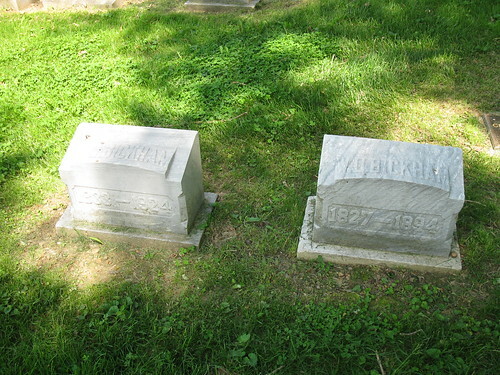 Abraham Strickle Bickham (born Aug. 28, 1860; died Jan. 7, 1929), who married Amelia Herr in 1900. Thomas Burns Bickham (born May 13, 1863; died June 19, 1863). Daniel Denison Bickham (born Oct. 31, 1864; died Mar. 3, 1951), who married Anna Stout in 1888, then later married Sylvia. Charles Goodwin Bickham (see sketch) (born Aug. 12, 1867; died Dec. 14, 1944), who never married. After W. D. Bickham’s death, his sons Abraham, Daniel, and Charles continued to operate the Journal, until October 1, 1904, when the Journal’s ownership was transferred from private ownership to a stock company. For a more thorough description of Bickham’s time in California, see: William D. Bickham, A Buckeye in the Land of Gold: The Letters and Journal of William Dennison Bickham, edited by Randall E. Ham (Spokane: Arthur H. Clark Co., 1996).Dayton Local History 979.404 B583B 1996. W. D. Bickham, “Salutatory,” Dayton Journal, July 28, 1863. 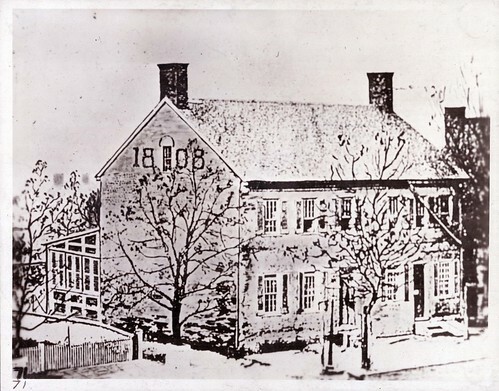 W. D. Bickham residence (right), 117 W. Monument Ave. 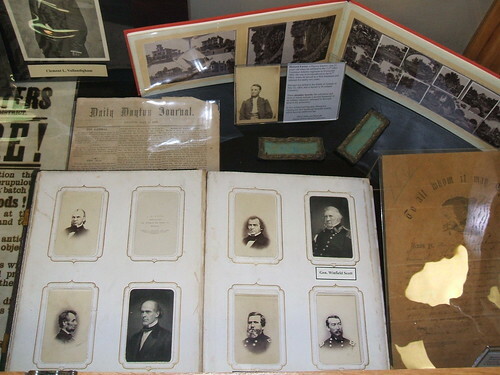 I have written a few additional blog posts about W. D. Bickham, including: “Bickham and the presidents” (Feb. 21, 2011) and “Civil War case exhibit, Bickham’s cartes de visite album” (Nov. 21, 2011). Bickham, William D. From Ohio to the Rocky Mountains: Editorial Correspondence of the Dayton (Ohio) Journal by William D. Bickham. Dayton: Journal Book and Job Printing House, 1879. Dayton Local History T78 B583. Bickham, William D. Rosecrans’ Campaign with the Fourteenth Army Corps: or, the Army of the Cumberland: A Narrative of Personal Observations with…Official Reports of the Battle of Stone River. Cincinnati: Moore, Wilstach, Keys, & Co., 1863. Dayton Local History 973.7416 B583R. Hamilton, William J. Dayton Newspapers and their Editors: Selected from the Dayton Public Library Newspaper Files. Dayton:Dayton Public Library, 1937. Dayton Local History 071.7173 D276. The History of Montgomery County, Ohio. Chicago: W. H. Beers & Co., 1882. “Maj. William Denison Bickham,” Book 3, pages 191-192. Dayton Local History 977.172 H673. Box1, Folder 5: Loyal Legion of theUnited States. Box1, Folder 7: W.D. Bickham: Biographical Notes – OhioStateUniversity’s Schoolof Journalism Hall of Fame. Daniel D. Bickham, “Tribute to Wm. D. Bickham, Civil Wartime Editor,” The Ohio Newspaper 17:4 (Jan. 1937), pp. 5-7. Dayton Local History Resource (LHR) File. Dayton Metro Library. Dayton Pamphlets File. Dayton Metro Library.